I remember the summer before we moved off-grid. I was in the throes of morning sickness with our baby girl and we were trying to prepare for off-grid life as much as we could while we still had the conveniences of on-grid living. We washed laundry by hand, we put tape over light switches to discontinue their use, and we got rid of about half of everything we own. The one thing we didn’t do was try to live without our large electric refrigerator. In hindsight, that would have been really helpful. Since moving off-grid I have struggled with a few major obstacles in our kitchen, and towards the top of that list would be not having enough cold space for keeping food. During the winter it wasn’t as big of a struggle. There are a lot of foods that can stay at a cool room temperature for extended periods of time. 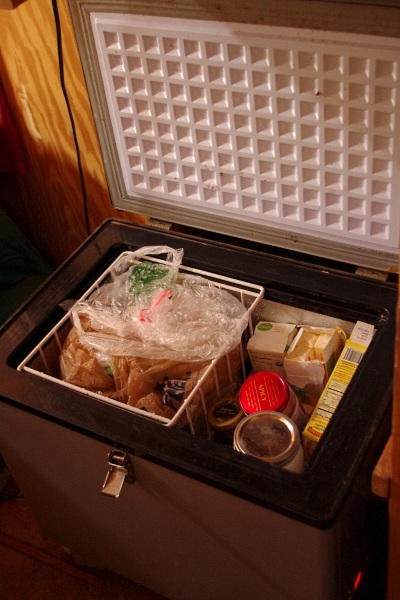 Because of this fact, I was able to turn our camper’s refrigerator into a root cellar of sorts (without it running). I stored eggs (fresh, unwashed) and hearty produce in there. So I was able to keep produce in our indoor makeshift root cellar and meat, dairy, and more perishable food items in our small solar refrigerator throughout the winter. This coming winter I am hoping to take advantage of colder days and simply store things outside in a safe container to save on solar power. Summer is much trickier since we live in a hot climate. Having a kitchen at 100+ degrees for days on end doesn’t even allow you to keep bananas or tomatoes on the counter for more than a couple of days. Since our homestead is in the throes of early soil development we simply aren’t producing much of our own food yet. 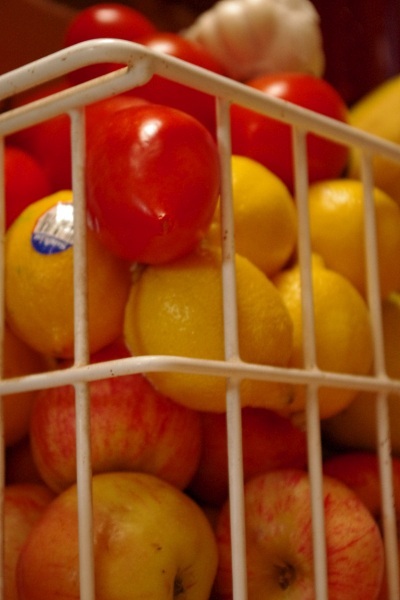 This forced us to use a cooler with ice in it to store much of our fresh produce. That, along with two grocery trips per week instead of our usual one, allowed us to continue to eat our usual diet. But this isn’t our long-term goal. You’ll notice that this is a pattern when I share how we’re doing things. When you start from scratch and are building your homestead as you go with no debt, a little bit of savings, and a lot of build-it-as-we-have-the-resources, you do what you can with what you have. Long term we hope to live underground with a root cellar attached. We hope to have a large enough flock of chickens that we can butcher one every week or two and get a few meals out of him without having to refrigerate meat. Long term we hope to preserve meat in traditional ways such as drying, curing, and pickling so as to avoid the need for refrigerators or canning. Long term we hope to have a continual supply of produce through the seasons as we implement successive planting and diverse permaculture practices. But for now I juggle foods from refrigerators to coolers, try not to leave anything out on these hot summer days, and try to learn about how our ancestors kept food before electricity and refrigeration. Do you have any follow up articles? I would love to read more about this as we are currently living offgrid and haven’t quite figured out the food aspect very well yet. I am looking at building a cold room, I was thinking of taking a normal shed style building and putting kool seal on all four sides, with installation inside and under the floor. Also putting a layer or two of kool seal on the roof. Do you think that would work?